To make an external data query to an Access database table from Excel 2016, you click the From Access command button on the Ribbon’s Data tab or press Alt+AFA. Excel opens the Select Data Source dialog box where you select the name of the Access database and then click Open. The Select Table dialog box appears from which you can select the data table that you want to import into the worksheet. After you select the data table and click OK in this dialog box, the Import Data dialog box appears. To select more than one data table in the database, click the Enable Selection of Multiple Tables check box and then select the check box for each table to import before clicking OK. The figure shows you an Excel worksheet after importing the Invoices data table from the sample Northwind Access database as a new data table in Excel. After importing the data, you can then use the AutoFilter buttons attached to the various fields to sort and filter the data. New worksheet after importing the Invoices data table from the Northwind Access database. 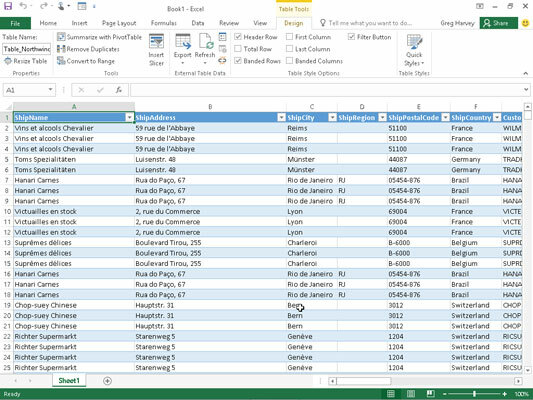 Excel keeps a list of all the external data queries you make so that you can reuse them to import updated data from another database or web page. To reuse a query, click the Existing Connections button on the Data tab (Alt+AX) to open the Existing Connections dialog box to access this list and then click the name of the query to repeat.